If you’re planning to transfer to a four-year college or university after attending Kirkwood, you’re in good company. 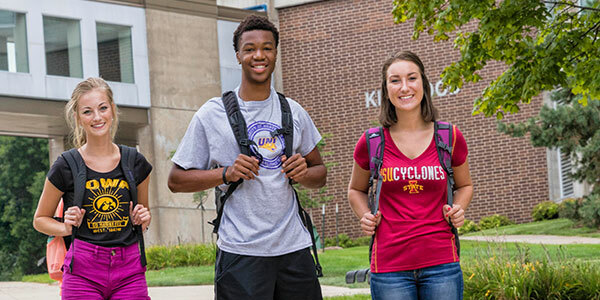 Each year hundreds of students transfer their Associate of Arts and Associate of Science degrees to four-year institutions in Iowa and across the country. Get your first two years of college in a supportive, affordable atmosphere that builds your skills while giving your mind a healthy challenge to prepare you for the next steps. We encourage you to plan ahead. Talk with one of the advisors about what you want to major in and what schools you’re thinking about transferring to. We’ll assist you with course selection at Kirkwood to help make sure credits transfer. Meet with representatives from four-year colleges and universities when they come to Kirkwood to talk with students interested in transferring. See who’s coming to visit. If you would like course equivalencies, please click on the colleges listed below for the information they have. For equivalency information on those colleges that are not hyperlinked, contact an advisor. If you have questions or need help figuring out course equivalencies, contact us at att@kirkwood.edu, 319-398-5540 or 1-800-332-2055 ext. 5540.